The amazing “Attic Clean-Out,” remains-of-an-estate, fundraiser yard sale is Saturday, October 14, 8am to 1pm, where we’ll have unique antiques and collectibles as well as Nicaraguan crafts, plus household, baby and clothing items, plants, foods and more, at 51 Mano Drive in Kula Kai subdivision, Kula, Maui. This yard sale is dedicated to raising funds for the 3rd wing of the Instituto Augusto Cesar Sandino secondary school at La Carreta, municipality of Villanueva, in Chinandega province. 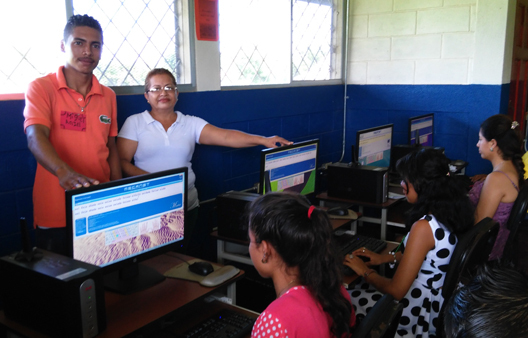 In a rural area of NW Nicaragua where there had never been a secondary school before, after much planning by the community and several years of fund-raising by our non-profit organization, ground was broken for the first two wings of the one-story school in August 2015 and completed in February 2016 when 130 students began their first academic year there. The room marked “Computacion” with its 10 computers is a very popular hub of activity Monday through Saturday, with weekday students, Saturday students and teachers learning to use programs. Spanish language arts, English, mathematics, science and history classes are going on in the other classrooms. This past summer during our team’s mission, during the days the deaf teens attended our day camp for special needs youth, they were taken to the new school’s computer room to begin to acquire much-needed keyboarding and computer use skills. Most of these students attend schools that cannot provide any computer classes. The community being served by the school has requested agricultural and animal husbandry courses along with a standard secondary curriculum. Therefore, a third wing, in the planning and fund-raising stage, will include a kitchen to process the produce the students and teachers will raise in the market gardens. Visit Somosohana Nicaragua on Facebook for photos of some of our unusual treasures!